It’s no secret that low-carb eating isn’t my favorite thing, but I think I may have found a go-to low-carb, gluten free, and dairy free dish. Hummus Crusted Chicken with Veggies is that meal, and thanks to Pinterest I’ve located yet another great recipe! I’m more the kind of person eat what I want in moderation and not try to stick to a diet of any kind. Frankly, it’s because I’d fail miserably as I lack self-restraint. And my love for cheese and pasta is a very real thing. So the idea of gluten and dairy free food always seems like a punishment. 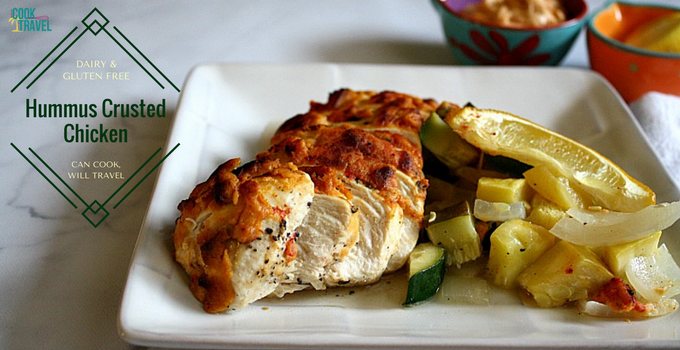 But when I’m aiming to eat healthy, this Hummus Crusted Chicken is a seriously great one to make. Lean proteins, tons of veggies, and that hummus adds such great flavor. The first great thing is that this dish was really easy to pull together. Chop up some yellow squash, zucchini, and onions and that’s about it. The worst part was seasoning the chicken because I had to, once again, deal with raw chicken. But it was surprisingly painless. Then it was a matter of layering the chicken on the seasoned veggies and covering them with hummus. Since I’m only one person, I didn’t need a giant amount of chicken. I grabbed a pack that said it had 2-3 chicken breasts and I ended up with 2 so that worked perfectly for me. When it came to the hummus, I went with a roasted red pepper variety, but I’m thinking you could be pretty adventurous with your hummus flavors. Then just add some lemon juice and smoked paprika and bake away. Because I’m extremely paranoid about raw chicken and it being fully cooked, I ended up baking mine for a good 35 minutes, but I have to tell you that this was probably the juiciest, most flavorful chicken I’ve ever made. 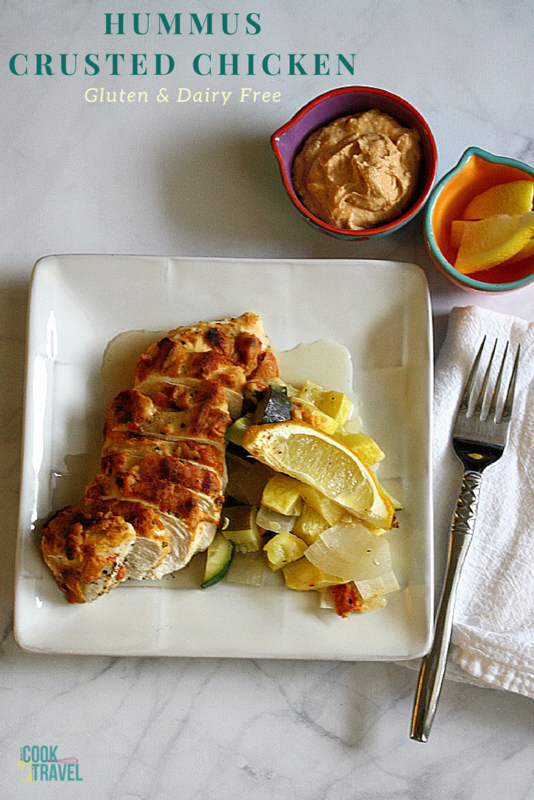 Delicious chicken plus the combo of hummus and lemon juice made for a seriously tasty and tangy dish. I didn’t even miss my usual side of carbs either, which is pretty huge for me. All in all, I’m extremely happy with this Hummus Crusted Chicken and whenever I make it, it comes out perfectly. I’m such a huge fan of zucchini and squash in general, which you are probably well aware of if you follow my blog. 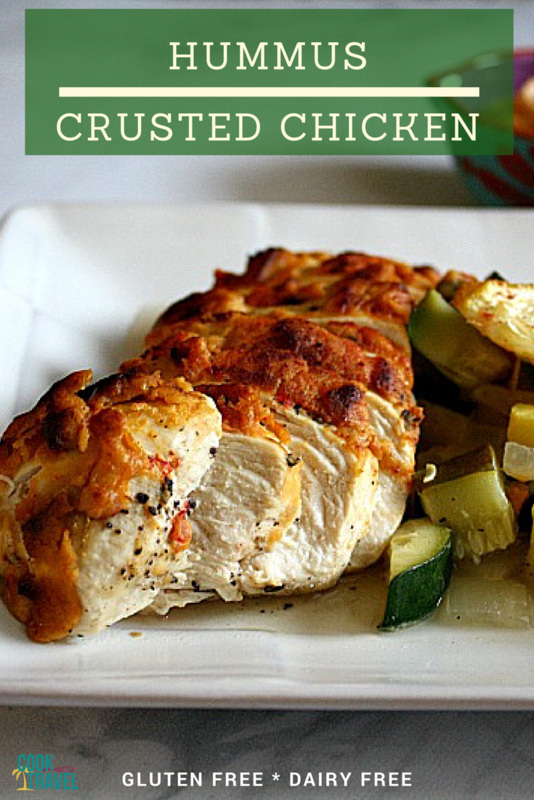 Plus this dish really couldn’t be much easier for a quick weeknight meal. I definitely think you should add this to your “dishes to make” list ASAP and pull it out when you know you have a busy week ahead. Go on and click here for the recipe and step by step instructions…did I mention this was SO good? !